*Discounted group rates are available for groups of 15 or more. Free parking is available for 34 cars. 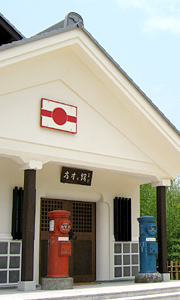 This museum houses almost all Japanese stamps from hand engraved stamps issued when the Japanese postal system stared in 1871 to the latest ones. It also displays historical materials related to postal system such as a wooden carrying box used by postal deliverers in the Meiji era and an octagon shaped wall clock placed at post offices. Please enjoy the enchantment of stamps and the depth of postal culture. Copyright © 有馬切手文化博物館 All Rights Reserved.